Coconut twists are are an old family recipe. My mum and aunty have made these for as long as I can remember and they evoke special childhood memories. Eaten straight from the oven , sticky crunchy coconut dotting the floor as the children sneak them off the tray when mum wasn’t looking. They were so good, when my mother and aunt opened a lunch bar in Queen Street in the 1970’s, they were a top seller. You can buy them in the Asian bakeries now but they’re the mass produced kind. None can rival that homemade taste and texture. Each roll slightly different from the next depending on how it was twisted and how much coconut sugar peaks out from each twist. And now the recipe has been published in Natalie Oldfield’s latest cookbook, “Love and Food at Grans Table”, a beautiful collection of grandparents recipes. Thanks to my dear cousin for sending in my aunt’s treasured recipes. 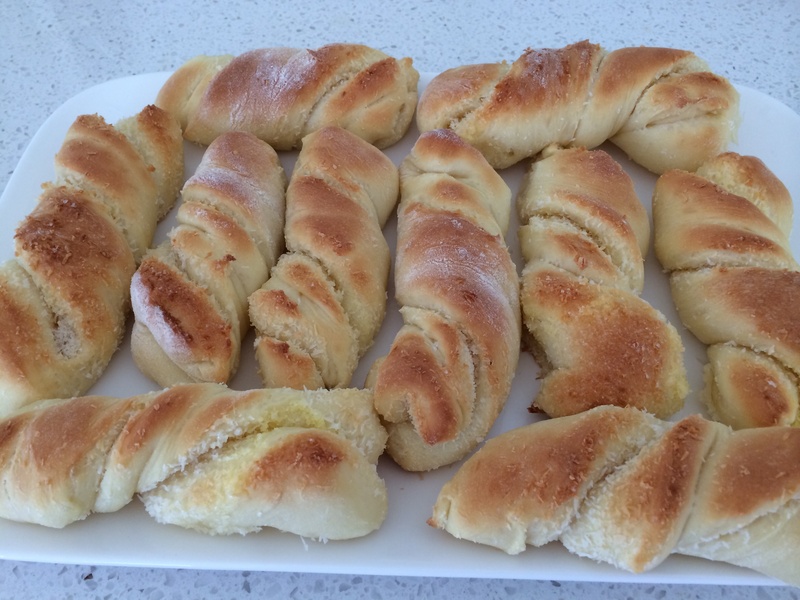 Converted the recipe for the Thermomix and oh my goodness, they’ve turned out fabulous. For some reason there’s alot of coconut sugar left over after rolling and making the twists so they weren’t sweet enough, next time I’ll melt the butter into the coconut sugar instead of buttering the rolled dough and sprinkling over the top. 6 1/2 cups of flour makes three trays of buns. The kids came home from school to these wonderful twists on the table and gave them the thumbs up. I am literally jumping up and down with joy, a recipe is preserved for the next generation. Combine and melt butter, milk and water in tmx – mix 2 mins, 50c , speed 2. Add other ingredients. Knead on dough mode 4 minutes. Leave dough in warm place till doubled in size. Punch down dough, roll out to into a large square. Mix filling ingredients and put the coconut filling on half the square and fold dough over. Cut into strips 4 cm wide twist twice and set onto lined or greased baking trays. Cover with tea towel and leave to rise until they have doubled in size. Preheat oven to 200c. Bake for 12-14 minutes. Leave to cool on trays. Makes 30.